Department of Examinations, Sri Lanka invites applications for the G.C.E (O/L) 2015. Applications are called from 20.05.2015 to 20.06.2015 from all the school and private candidates who intend to sit the examination. The Specimen Application Form given here is only for the private candidates. Every private candidate should read and understand this notice completely and complete the Application Form. A special consideration should be given to write the accurate number when mentioning the town number and subject numbers in the Application. 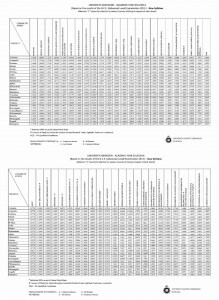 The relevant application forms have been sent in order to receive by 20.05.2015 to the government schools and approved pirivenas in which the students have sat the G.C.E. (O/L) Examination before. If any school has not received the applications by now such schools should inform the School Examinations Organization Branch immediately. Only those who have left school can apply as private candidates. Any one applying for this examination as a private candidate while still being in school is illegal. If such an instance is revealed, it will result in being debarred from sitting examinations. Private Candidates means Any person not attending any state school, non fee-levying approved school or recognized Pirivena may sit as a private candidate. Applications for this examination will be received from private candidates only up to 20th June 2015. And private candidates should select the town closest to their permanent residence for the examination. 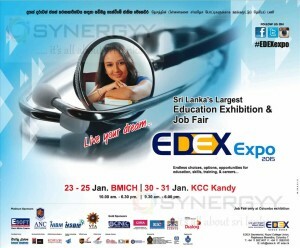 EDEX Expo 2015 Sri Lanka’s Largest Education Exhibition & Job Fair schedule to be held in Colombo and Kandy this Year. Time: 10.00 am. – 6.30 pm. Time: 9.30 am. – 6.00 pm. 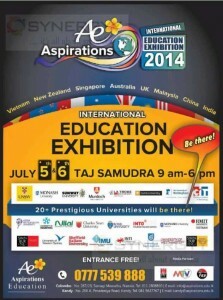 For more details contact to EDEX Secretariat, Royal College Union, Rajakeeya Mawatha, Colombo 7. Recently the University Grant Commission announces its Z-Score cut off marks for the University admission for the Academic Year 2013/2014 for the candidate who did G.C.E (A/L) in 2013. Applications from the repeat candidates sitting for the following Second Semester examinations scheduled to be held in December 2014 & January 2015. 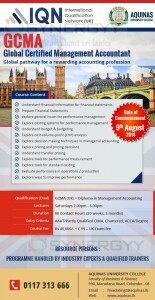 Applications for Part A and Part B will be received from 16th September to 03rd October 2014. Applications received after closing date will be rejected. The College of Chemical Sciences invites applications from students who would like to follow the chemical Science as their interested areas of servicing. 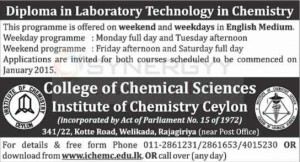 The College of Chemical Sciences is offering a Diploma in Laboratory Technology in Chemistry for those who just pass out G.C.E (A/L) or those who would like to learn more in Chemistry and Chemical information. This programme is offered on weekend and weekdays in English Medium. Applications are invited for both courses scheduled to be commenced on January 2015. Yes, it’s that time of the life! Time sure flies and your dearest child has completed the school days and is ready to take the next step of becoming a University Undergraduate. National School of Business Management-The Nations Premier Degree School offers the best option to your child by offering world class degrees approved by University Grants Commission of Sri Lanka and affiliated to world’s top ranked universities. At NSBM your child is groomed under a well-qualified lecture panel turning them to a graduate equipped with the best of skills required to suit industry standards and developed to a global citizen, with esteemed personality making them perfect Graduates. Foundation programme for bachelor’s degree are available to complete in a one year Foundation Diploma after your O/L and join the Bachelor’s degree programme of your choice. The Department of Higher Education’s University Grants Commission released minimum Z-scores for selection to courses of study for each district and detailed information of course selection based on the GCE (A/L) Examination in 2013. All the Very Best for those Students who gets More than Cut off Marks!!! All the Best to All Students who gets their Result. Sri Lanka’s second private medical college will be opened in Kandy. Plans have been finalized and construction work will begin soon, said Higher Education Minister S.B. Dissanayake. The minister said there is a heavy drain on foreign exchange due to a large number of Sri Lankan students seeking higher education abroad. Since the duty of a government is to ensure a supply of education facilities to fit the demand, it had decided to fulfil this need by starting private medical colleges and technological institutions. He said he had introduced six degree awarding institutions using powers vested in him as this was the latest trend in neighbouring countries such as India and China. He said new facilities were also being introduced in state universities under this new program. He said a new Engineering Faculty has been launched at the South Eastern University and a Faculty of Management has been started at the Peradeniya University. Two new engineering faculties would be started at the Sri Jayewardenepura and Kelaniya Universities and another two medical faculties would be started at the Jaffna and Sabaragamuwa Universities. South Asia’s first Green University Town, NSBM will be open for both Sri Lankan and foreign students by the end of 2015. The university town is a great investment as the country can save a large amount of money spent by students for their foreign university degrees. The university, being constructed in 26 acres at a cost of Rs. 10.2 billion, will have state-of-the-art lecture hall facilities, laboratories, libraries, modern auditoriums and cutting-edge tech labs, proffering the highest standards of education at its three faculties of Computing, Management and Engineering. It will house 30,000 local and foreign undergraduates. The university was closed indefinitely as the lecturers had kept away from lectures demanding a safe environment in which to work following an incident where the students had detained the Vice Chancellor and several lecturers for a few hours on June 27 during the unrest. The authorities had also decided yesterday to pardon 27 students who have been suspended from attending lectures on the grounds of discipline which would also enable them to attend lectures, Vice Chancellor Professor Ranjith Wijewardane said. The Vice Chancellor had met the parents of the students concerned as instructed by President Mahinda Rajapaksa at the Anuradhapura District Development Committee meeting that was held on July 25. Professor Wijewardane said that the parents too had requested him to pardon the students and he had decided to heed their request and reopen the university as instructed by the President. The Vocational Training Authority (VTA) of Sri Lanka will establish a separate school for beauty culture in 2015 with the intention of producing professional and qualified beauticians to the field. The official stated under a private-public partnership concept. Nature’s Secrets and VTA have launched many programs since 2005 to improve the skills of personnel involved in the beauty culture industry. It is important to offer special full institutional level courses for the beauty cultural due to the demand in srilanka and aboard. This would be an valued added professional qualifications for those who looking into the industry of beautician or beauty cultural coordination. The Cabinet will take a decision on whether to admit students from international schools to public schools for continue their G.C.E (A/L) examination of Srilanka. Education Ministry Secretary Anura Dissanayake stated that the Cabinet would take up a report by the Education Minister on his decision not to admit international school students to follow GCE Advanced level classes in public schools. The Education Minister said that the Education Ministry believed that students of international schools should not be granted admission to public schools as they would then be taking the place of underprivileged students and he further said there was already severe competition among students who were going to public schools to get into public schools that offered G.C.E. Advanced Level (A/L) classes in the English medium and more competition would be detrimental to all. At present, nearly 300 students who completed the G.C.E Ordinary Level (O/L) examination in international schools are seeking admission to G.C.E Advanced Level (A/L) classes in public schools on the basis that their future would be otherwise uncertain. Recently I read a news articles in paper, it stated that Srilanka is the top on literacy ratio in South Asia as 87%; which is a 3% growth from 2001 to 2014. 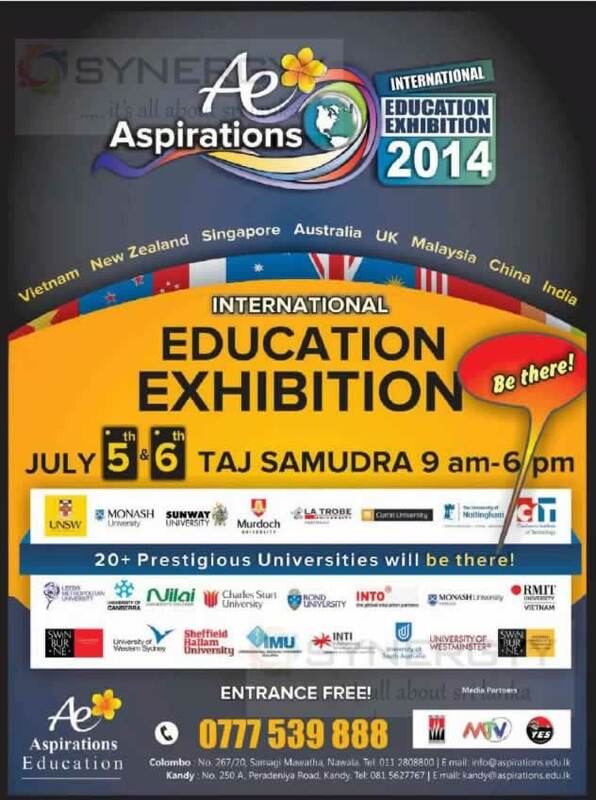 As it stated the Ae Aspirations organised an International Education Exhibition 2014 in Taj Samudra on 5th & 6th July 2014, from 9 am to 6pm. For the first time in the history of the University of Jaffna, a private entity, Kelani Cables is signing an agreement for three years with the Faculty of Engineering to enhance Carrier Development of School leavers and self employed electricians in the North. This historic partnership was taken place at the Kelani Cables Auditorium with the participation of the Vice Chancellor University of Jaffna, Snr.Prof. (Mrs) Vasanthy Arasaratnam. Dean Faculty of Engineering, Dr. A. Atputhurajah and Dr. T. Thiruvaran Course Director, Kelani Saviya, UoJ. The CEO Kelani Cables Pic, Mahinda Saranapala and VC UoJ, Snr. Prof(Mrs) Vasanthy Arsaratnam had signed the historic agreement. Kelani Saviya is a Unique CSR project jointly operating since 2007. Prof. J. B. Ekanayake, Head Electrical and Electronic Engineering UoP and Jayantha Wijesinghe (then Asst. Manager Marketing) were the co-initiatore of this unique CSR Project. 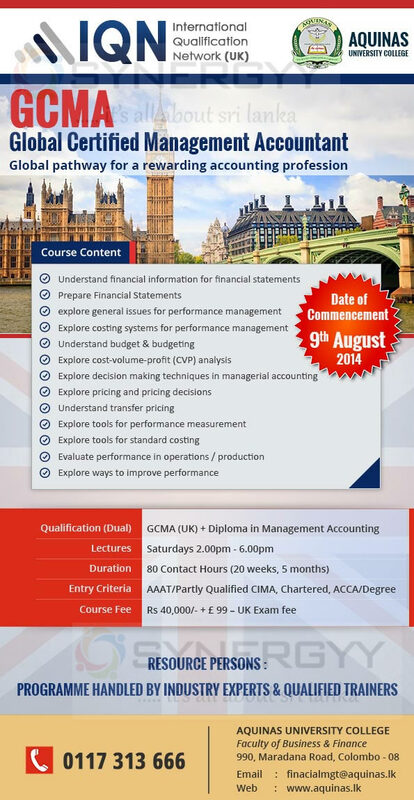 Aquinas invites applications for the GCMA Global Certified Management Accountant professional qualification. The Global Certified Management Accountant is a professional membership from GCMA, which is made an agreement with CIMA very recently. 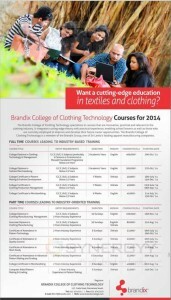 The Brandix College of Clothing Technology specializes in courses that are innovative, practical and relevant to the clothing industry. It integrates cutting-edge theory with practical experience, enabling school leavers as well as those who are currently employed to improve and develop their future career opportunities. 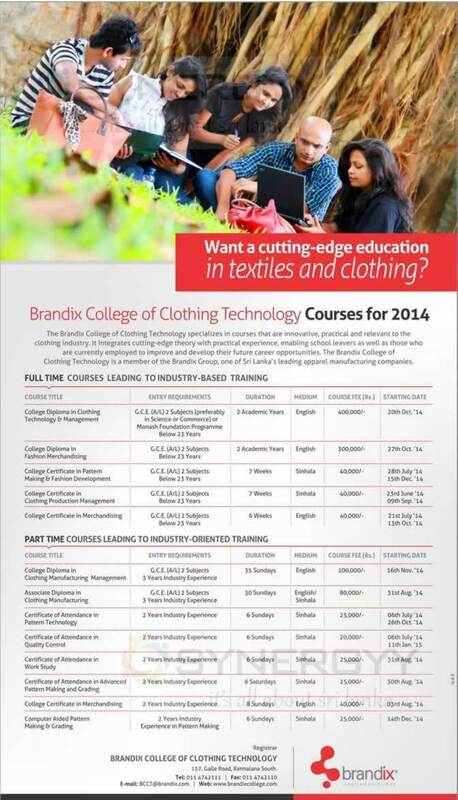 The Brandix College of Clothing Technology Is a member of the Brandix Group, one of Sri Lanka’s leading apparel manufacturing companies. 157, Galle Road, Ratmalana South. A one day workshop for Professional Tourist Guide Lecturers and other related professionals will be held on June 21 from 8.30 am to 6.00 pm at the main Library of the University of Colombo. Participants’ knowledge on investment opportunities in Sri Lanka, government incentives and policy consultation for foreign investments, positive thinking, leadership skills and communication skills are expected to be improved. As they would be educated in healthcare, health safety, sustainable and environmental standards, their practical knowledge in preparing project reports would also be improved. Promotion Officers of the Sri Lanka Investments Board, Sri Lanka Tourism Development Authority officials and University Lecturers too would engage as resource persons of the workshop. A valuable certificate for participants who successfully complete the one-day program would be issued by the Department of Economics of the University of Colombo. Those interested in this regard, may obtain further details by calling Asanka Senanayake on 0718716755 and the Chairman of the Russian Tourist Guide Lecturers’ Association on 011258266 or 0716060995. MOS Lanka Holdings, a Sri Lankan based diversified company in Russia is negotiating with a Russian Medical University to set up a University in Sri Lanka. “This Russian University is keen to set up a University in Sri Lanka so that they could also have an intake of students from the South Asian Region. He said that they are also in talks with a Sri Lankan private sector hospital so that they could get their assistance to train students who study in this proposed University. “We are now currently working with government authorities to obtain the necessary approvals”. Mos-Lanka Holdings is made up of six subsidiary companies, involved in diverse fields such as Higher Education in Medicine in the Russian Federation, for International Students, export of connoisseurial brands of Pure Ceylon Tea, Warehousing, Logistics, Tourism, Leisure and the Hospitality industry. Forty secondary schools started using new mathematics e-learning programs to boost students’ mathematics ability and to determine if e-learning should be incorporated into mathematics lessons nationwide. “Boosting mathematics skills and critical thinking is essential in today’s modern world. Computer technologies can complement regular classroom teaching in a way that can bring everyone up to international levels in an individual way,” said Asian Development Bank’s (ADB) South Asia Department Director Sungsup Ra. Under a $ 725,000 grant, ADB has translated the mathematics e-learning programs of Khan Academy and Math-Cloud into Sinhala. These will be used in 20 schools each as part of daily a mathematics lessons on a six month trial basis through to the end of 2014. Student performance will then be assessed to determine how effective the programs were in boosting students’ mathematics achievement and confidence. In many developing countries, the quality of education suffers due to weak teacher training, inadequate school facilities and equipment, and outdated curricula. Although many governments in Asia see the value of introducing information communication technologies into schools, the focus has largely concentrated on providing computers and other hardware, rather than the software and computer programs needed to make use of them. The result is that many students in the region leave school with an education that is ill-fitted to a modern global economy. In Sri Lanka, around half of 16year olds have to retake the exams necessary to advance to their last two years of schooling. The government has been working to find ways of improving the quality of mathematics education in the country’s 9,905 schools, including introducing more software-based platforms to promote more dynamic learning and teaching. Laksala initiated the Design Competition 2014 to commemorate a bountiful Golden Jubilee in hopes of discovering the creative abilities of Laksala Registered Entrepreneurs by inviting them to participate in this memorable event. The first stage will be the paper based designs, where all design submissions in each respective category will be submitted as sketches. Designs that are chosen from stage one will then be manufactured and presented for stage two. All entrepreneurs who wish to take part in the competition may select one or more categories mentioned below to submit one or more designs per category. No: 215, Baudhaloka Mawatha, Thummulla, Colombo 07. A workshop will be held to brief all participants on the 18th June 2014 From 10 am -12 noon At the “Ape Gama” premises in Battaramulla. For more information regarding the rules and regulations of the competition call 0112055501. Divi Naguma National Programme Entrepreneurs and New Entrepreneurs may register with Laksala in order to improve their creative abilities and refine the overall quality of their products. The Academic activities for the first year registered students (2012 A/L) of the Faculty of Arts will commence on 25th June (Wednesday) 2014. 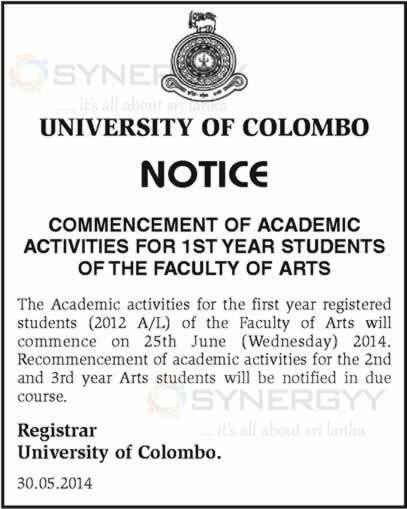 Recommencement of academic activities for the 2nd and 3rd year Arts students will be notified in due course. A mega book dansela organised by the Education Ministry will be held on June 12 and 13 in view of Poson Full Moon Day at the Pahatha Maluwa of the Mihintale sacred area. This is organised on a concept of Education Minister Bandula Gunawardena. Donors can hand over books to national schools and Provincial and Zonal Education offices before June 6. Additional reading books, past papers and literature books can be handed over to the Education Ministry Publication Bureau. Contact 0112784839 or 0112784869 for details. APIIT Sri Lanka offers high quality British degrees of international repute at its City Campus in Colombo and large numbers of Sri Lankan youth benefit from these programmes annually. However, many students with academic potential cannot access these nigh quality education programmes due to financial constraints. The APIIT Merit Scholarship Scheme has been designed to provide financial assistance to deserving students with GCE Advanced Level so that they can enroll in a British degree programme. 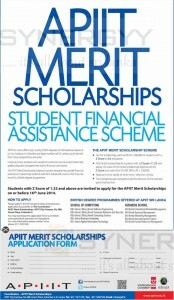 Students with Z Score of 1.25 and above are invited to apply for the APIIT Merit Scholarships on or before 16th June 2014. 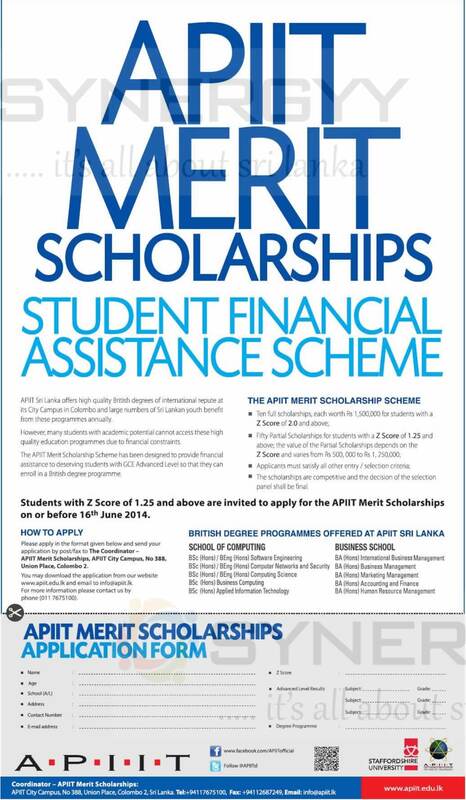 Please apply in the format given below and send your application by post/fax to The Coordinator -APIIT Merit Scholarships, APIIT City Campus, No 38 Union Place, Colombo 2. 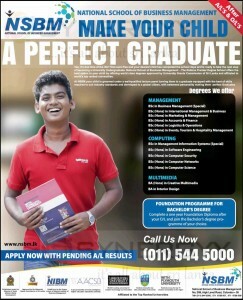 You may download the application from our website www.apiit.edu.lk and email to info@apiit.lk. For more information please contact us by phone (011 7675100). Post graduate Institute of Management (PIM) Master of Business Administration (MBA) – Applications calls now; till 30th August, 2014. PIM Pioneered the MBA programme over 30 years ago and continues to offer the leading and most sought-after MBA programme in Sri Lanka PIM offers its new MBA programme that is aimed at developing five key competencies in a challenging, yet an enjoyable setting, that enables its participants to strike the vital work-life-learn balance. PIM’s MBA programme has been re-engineered, based on our experience of conducting the programme for over thirty years, and the emerging needs of today’s competitive local and global markets. The programme spans a period of two years and moves logically and sequentially from courses on Management Foundations to Integrative Studies, followed by Elective Courses and Research Paper/Project. For those who are academically bent the thesis option is also available. The programme is structured on robust theoretical foundations and immediate practical applications. The new MBA programme is designed to help the busy working manager. It is our experience that those who enjoy study, do best in the programme, and it is our endeavour to provide a rich learning experience that will transform student-managers into outstanding leaders and achievers. 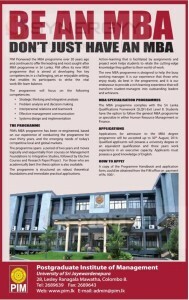 The MBA programme complies with the Sri Lanka Qualifications Framework (SLQF)-Exit Level 8. Students have the option to follow the general MBA programme or specialize in either Human Resource Management or Finance. Applications for admission to the MBA degree programme will be accepted up to 30th August, 2014. Qualified applicants will possess a university degree or an equivalent qualification and three years work experience in an executive capacity. Applicants must possess a good knowledge of English. A copy of the Programme Handbook and application form, could be obtained from the PIM office on payment of Rs. 500/-. Posted on June 3, 2014 Categories Degree Programmes, Education, My Observations and thoughts, Postgraduate and Master Degree, Prasanna's Diary (Sharing), Professional Qualification, Seminars, Workshops, Conferences and Short CoursesTags Education Supports, Master in Business Administration (MBA) in Srilanka, PIM - MBA Degree Programme, Sale/ Promotion/ events in Srilanka - August 2014, Sale/ Promotion/ events in Srilanka - July 2014, Sale/ Promotion/ events in Srilanka - June 2014Leave a comment on Post graduate Institute of Management (PIM) Master of Business Administration (MBA) – Applications calls now; till 30th August, 2014. 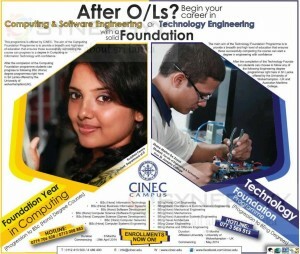 CINEC invites applications for the Foundation Programme leading to Bachelors degree programme. This programme is offered by CINEC. The aim of the Computing Foundation Programme is to provide a breadth and high level of education that ensures those successfully completing the course can progress to a degree in Computing or Information Technology with confidence. After the completion of the Computing Foundation programme students can progress to following BSc (Hons) degree programmes right here in Sri Lanka offered by the University of wolverhnmption(UK). The main aim of the Technology Foundation Programme is to provide a breadth and high level of education that ensures those successfully completing the course can start a degree in engineering with confidence. After the completion of the Technology Foundation students can choose to follow any of the following Engineering degree programmes right here in Srilanka offered by the University of wolverhnmption(UK) and Australian Maritime College. 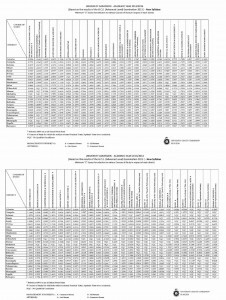 The G.C.E (A/L) 2013 Examination Re-Scrutiny (Re-Correction) result has been released to Department of Examination website http://www.doenets.lk/ . Those who have done their Advance Level examination in 2013, could obtain their result by Click Below link of Department of Examination website.